Just a quick post today featuring some of the flowers I received for Mother's Day. The white lilacs were not a gift, but are from our son and daughter-in-law's garden where we enjoyed a great brunch cooked by the men in the family and a sunny afternoon outside. 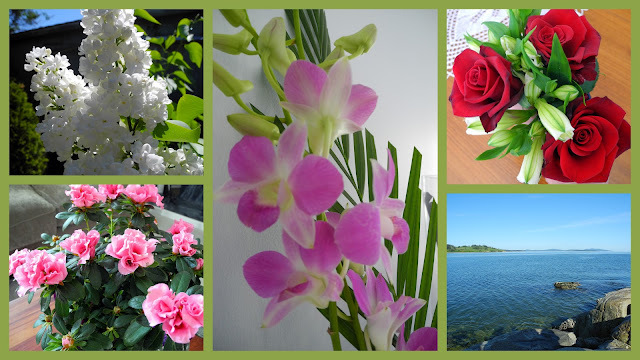 An azalea plant from my husband, orchids from my daughter and son-in-law, and red roses from my son and daughter-in-law. And a phone call from my daughter in Spain. What a perfect day, surrounded by love. I am so blessed. Late afternoon Tim and I went for a walk on the beach - it truly felt like summer, with a few brave souls swimming and many families picnicking and enjoying the glorious weather. Linking to Mosaic Monday and hoping you all had a wonderful Sunday, whether you celebrated Mother's Day or not. It was such a beautiful day, wasn't it? I was on the ferry, enjoying the view of sea and mountains - gorgeous! Isn't it nice to have so many leveling gestures coming your way? Your flowers are all beautiful. Happy mothers day. Those flowers are gorgeous and it sounds like the perfect Mother's Day! I know you are truly blessed! It looks like you had a perfect day! Glad the weather cooperated there, it was so rainy and windy over here! Hugs, and thanks for always being so kind to me, Lorrie! Your support means a lot. Such love flowers you were showered with! And I so enjoyed the post about your beautiful mom! What a treasure we have in our moms!. Good morning. Beautiful flowers for Mother's Day. Hope you have a great day. Your flowers are beautiful. I see that you have a head start on the garden with the new azalea bush. A walk there at the end of the afternoon looks like perfection. Glad to hear that you had such a lovely day and that your daughter called from overseas. It sounds like your day was a delight from start to finish! I think mothers everywhere celebrated in the same way yesterday...with flowers, and family and sunshine! Beautiful flowers all but the lilacs are my favorite for their perfume. I'm imagining them right now because I can't grow them here in the south where it's too warm and humid. They thrived in my garden in England growing up - perhaps that's why they are so loved - memories again! Beautiful flowers for a beautiful lady! Enjoy all your pretty blooms! It was so beautiful over the weekend - wasn't it? I hope it lasts, it sure makes everyone feel so happy! Your flowers are lovely, I bet they smell so nice. Oh...I am in awe of the white lilacs. I'm glad your Mother's Day was so sweet.